In his first seven months as president, Donald Trump has generally drawn high job approval ratings among Republicans. But a new survey finds that nearly a third of Republicans say they agree with the president on only a few or no issues, while a majority expresses mixed or negative feelings about his conduct as president. Overwhelming shares of Democrats disagree with Trump on all or nearly all issues and say they do not like his conduct as president. The survey, conducted by Pew Research Center Aug. 15-21 among 1,893 adults, finds that 15% of Americans say they agree with Trump on all or nearly all issues, while another 18% say they agree with him on many but not all issues. Most say they agree with Trump on either a few issues (21%) or “no or almost no issues” (45%). Setting issues aside, a majority (58%) say they do not like the way Trump conducts himself as president, while 25% have mixed feelings about his conduct. Just 16% say they like the way he conducts himself as president. Among Republicans and Republican-leaning independents, just 31% say they agree with Trump on all or nearly all issues, while an additional 38% agree with him on many, but not all, issues. Fully 93% of Democrats and Democratic leaners say they agree with Trump on, at most, a few issues, including 77% who report virtually no agreement with Trump on issues. In views of Trump’s conduct as president, 46% of Republicans express mixed feelings, while 19% say they do not like his conduct; 34% say they like the way he conducts himself as president. Among Democrats, 89% have a negative view of Trump’s conduct. The survey finds that most Republicans and Republican leaners favor Trump listening more to members of the party with experience in government. 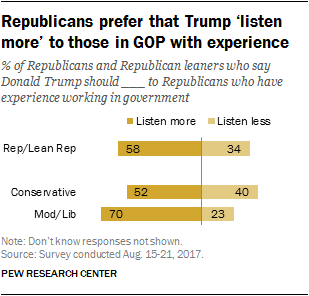 Nearly six-in-ten (58%) say Trump should listen more to Republicans who have experience working in government, while 34% say he should listen less. However, conservative Republicans (52%) are less likely than moderate and liberal Republicans (70%) to say Trump needs to listen more to members of the GOP with experience in government. Most of the findings in this report are based on telephone interviews conducted Aug. 15-21, 2017 among a national sample of 1,893 adults ages 18 years or older who were previously interviewed in Pew Research Center surveys conducted in June and July. The open-ended questions analyzed in this report are from a separate survey conducted Aug. 8-21, 2017 among 4,971 adults on the Center’s American Trends Panel (ATP), a nationally representative panel of randomly selected U.S. adults. See the Methodology section of this report for more details. A separate survey, conducted on Pew Research Center’s nationally representative American Trends Panel, finds stark divisions between those who approve and those who disapprove of Trump’s job performance in their impressions of the president. This survey, conducted online Aug. 8-21 among 4,971 adults, asked respondents to describe in their own words what they like most about Trump and their biggest concern about how he is handling his job as president. For a sample of responses, see verbatim on positive and negative impressions of Trump’s presidency. Trump’s personality is mentioned quite often both positively and negatively. Among those who approve of Trump’s job performance (36% of the public), more than half (54%) volunteer something about his personality or general approach as what they like most; mentions of Trump’s policies or agenda are a distant second, at 14%. Some of those who cite Trump’s personality as what they like most about him point to his leadership and his determination to keep promises, while others praise Trump for his candor and for being unlike a typical politician. Trump’s detractors have a hard time coming up with anything they like about him. Among those who disapprove of how he is handling his job (63% of the public), “nothing” is by far the most frequent response for what they like most about Trump. About four-in-ten (43%) say explicitly they like nothing about Trump’s performance and another 16% respond to this question by volunteering things they don’t like about him. Those who disapprove of Trump cite several concerns about him: 32% point to his personality, including his temperament; 25% mention his policies, particularly foreign policy and its impact on U.S. standing in the world; and 19% fault his intelligence or competence. Trump’s supporters raise different concerns: 17% of those who approve of his job performance cite his use of Twitter and other social media, while 16% say they are most concerned about obstruction from others, such as Congress and the news media. About one-in-ten of those who approve of Trump say their biggest concern is his personality (11%) and a similar share point to his policies (10%). Overall, 4% of Americans mention concerns about Trump’s handling of racial issues or his own attitudes about race. However, more cite this concern after the Aug. 12 violence in Charlottesville, Virginia than did so before that point. From Aug. 13-21, 9% cite this concern, compared with 2% in earlier polling. Among those who disapprove of Trump, 15% of those completing the survey on or after Aug. 13 cite concerns about Trump’s approach to race, up from 3% who mention these concerns in the days before. Public more confident in Trump on trade than on immigration, nuclear weapons. In the Aug.15-21 telephone survey, half of Americans say they are very or somewhat confident in Trump to negotiate favorable trade agreements with other countries; nearly as many (46%) are at least somewhat confident he can make good appointments to federal courts. 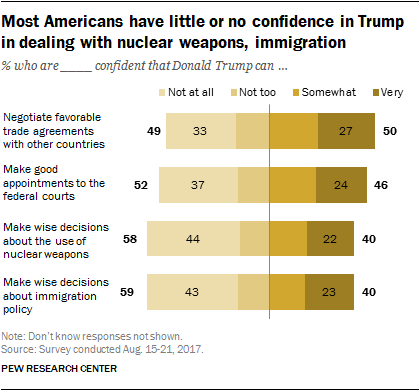 Trump draws less confidence in his ability to make wise decisions about immigration and the use of nuclear weapons (40% each). Majorities say they are not too or not at all confident in Trump’s handling of these two issues. Few describe Trump as “even tempered.” Just 26% of the public, including 45% of Republicans and just 11% of Democrats, say the phrase “even tempered” describes Trump very or fairly well. However, about half of Americans (51%) view him as intelligent. For negative terms, majorities say that the traits selfish (65%) and prejudiced (55%) describe Trump very or somewhat well. Partisans divided on Trump’s handling of Russia. Roughly half of the public (52%) say Trump is not tough enough in dealing with Russia; 35% say he is about right, while 6% say he is too tough. But there is a stark partisan divide: 74% of Democrats say Trump is not tough enough, compared with just 26% of Republicans. About two-thirds of Republicans (66%) say Trump is about right in dealing with Russia.